Typically, any talk about “consumers” has been firmly in the context of retail. A consumer is someone who purchases goods or services for personal use, right? Consumers buy groceries, cars, iPhones, clothes, fast food, books, music – and they shop around to make sure they’re getting the best consumer experiences at the best prices. Increasingly, however, the word “consumer” is creeping into the healthcare lexicon, too. And it’s not hard to understand why – in today’s world, where there are more options than ever before for people to shop around for the best healthcare and medical treatment, patients are undeniably consumers, too. In the world of healthcare, providing the best patient experiences possible is fast becoming the name of the game if providers are to coax people through the front door, keep them coming back, and ensure that they recommend the services provided to their friends, family, and social networks. It’s about building trust, building loyalty, and understanding the modern patient’s needs. And that means providing both a first-rate patient experience and a 21st century consumer experience to boot. At Geisinger Health in Pennsylvania, hospital officials are determined to keep their patients-come-consumers happy. They want to provide an unforgettable experience for everyone – and if they fail, they want to know about it and take steps to put it right. This is the driving force behind Geisinger’s ProvenExperience program – a money-back guarantee that dissatisfied patients can claim in full for all expenditures, no questions asked. Particularly, what Geisinger wants to know is whether patients have experienced “kindness and compassion” in their care. If they feel they haven’t, they are encouraged to leave their feedback via the ProvenExperience app, and request a refund for their financial responsibility. Patients can offer their opinions on everything from bedside manner to parking facilities, and then use the app to determine the amount of co-payment (if any) they would like to receive back. Geisinger Health System CEO David T. Feinberg, M.D, believes that this is precisely the sort of consumerist thinking that the healthcare sector has been lacking. Ultimately, the goal of the ProvenExperience initiative is to invite patients to speak their minds in order that Geisinger can learn and improve. And it highlights a somewhat paradoxical situation that has perhaps been left unspoken for too long – that customers in other sectors (such as retail) have often received better experiential treatment than they have in healthcare, where they need it most. A year after the program was launched, about $500,000 in refunds have been paid – a figure that amounts to less than 0.5% of Geisinger Health System’s annual revenue of roughly $11.56 billion. What’s been found is that, far from abusing the program (one of the main concerns from detractors), patients who turn to ProvenExperience are raising genuine concerns and usually only ask for a portion of their money back to compensate – despite their right to request the full amount. And the payoff is that most refund requests point out clear opportunities for improvement. The ProvenExperience initiative has led to a 23% increase in direct messages to Geisinger relating to episodes of care from patients and patient advocates. 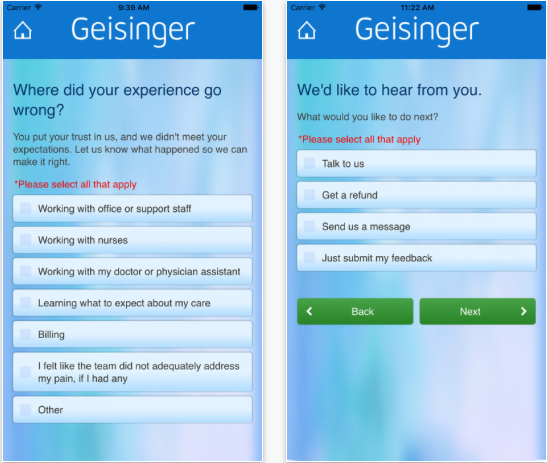 And this feedback has informed new customer service features, Geisinger’s new website design, and improved communication pathways that help patients find doctors and access their health information. It may have seemed like a radical or “stupid” idea to many, but, ultimately, ProvenExperience has taught Geisinger some invaluable lessons about how to improve the patient experience, and at a time when patients and consumers are more alike than ever before, this can only spell success. The last word goes to Feinberg. Hear Greg Burke, Chief Patient Experience Officer, Geisinger Health System, at Next Generation Patient Experience 2017 this November.